Wall strip 1796 mm. Used in the storage system Kenovo DuraTrax for mounting on a rail or wall mounting. In the guide can be inserted into the bracket (SHVBR1, SHVBR2) for mounting shelves; SHVWSA adapter for mounting baskets and hooks; sliding basket (SHVSB1, SHVSB2). Wall strip 772 mm. Used in the storage system Kenovo DuraTrax for mounting on a rail or wall mounting. In the guide can be inserted into the bracket (SHVBR1, SHVBR2) for mounting shelves; SHVWSA adapter for mounting baskets and hooks; sliding basket (SHVSB1, SHVSB2). Wall strip 386 mm. Used in the storage system Kenovo DuraTrax to extend or for wall mounting. Has no recess for mounting on a horizontal rail. For join through the connector of strip SHVWSJ1. Mounted on the wall. On the rail not is fixed (no trim). Basket for 5 balls. System storage Kenovo DuraTrax complete with fasteners. Mounting on the rail (GSR1, GSR3, GSR6). Mounting on a single mounting unit (GSR2, GSR7). Basket (size 380mmH300mmH120mm) storage Kenovo DuraTrax complete with fasteners. Mounting on rails (GSR1, GSR3, GSR6). Mounting on a single mounting unit (GSR2, GSR7). Mounting on vertical guides (SHVWS1, SHVWS2, SHVWS3, SHVWS4) adapter SHVWSA. Racket storage. Rack for storage of tennis rackets and 6 balls. Used in storage systems Kenovo DuraTrax. 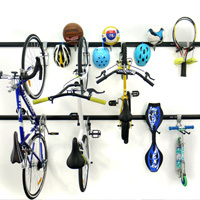 UltraFlex horizontal bicycle storage(2 hooks necessary) or vertical bicycle storage(1 hook). Hook for storage of one ball is used in storage systems Kenovo DuraTrax. Hooks for storing snowboards, kayaks and long objects used in storage systems Kenovo DuraTrax for hanging objects weighing less than 30 kg. Hook for skis. Used in the storage system Kenovo DuraTrax. Гакі для вуд. Выкарыстоўваецца ў сістэме захоўвання Kenovo DuraTrax.